We closed our 3rd season in NC this past weekend with a World Premiere at the Durham Arts Council’s PSI Theatre! We were absolutely honored to receive a standing ovation and a sold out show! This work was inspired by collaboration and interpretation of the emotive architecture rooted in William Forsythe’s Improvisation Technologies and was our first collaborative project with acclaimed soloist, international guest artist and former Forsythe dancer Elizabeth Corbett. The work also built from my nine year relationship with Elizabeth as my teacher, choreographer and mentor. Our work throughout the years has ultimately taken the form of collaboration by utilizing the nine point system developed by William Forsythe as a way of engendering movement through a specific set of directional tasks. Over loads of dinners and coffee conversations last summer, we acknowledged how much we have learned from each other and after years of studying and performing under her, we have grown into a rich friendship with a keen interest in each others creative process. Ultimately we decided to create our own separate works in different locations from a singular script that Elizabeth would develop based on the Laban cube. I was excited by the challenge of working in this new way with my dancers and by honing in on the emotive potential of architectural thinking. I’m certain that this is just the beginning of many more collaborative projects we will do together. The title of the work implies the oneness out of many as a response to both the polarization we have felt as a nation as well as how the courageous process of creation unites us. We were also joined by international composer and pianist Alejandro Santoyo who performed an original score for the work. Alejandro performed live while utilizing the composition developed from the movement’s organizational principles to allow for moments of improvisation. 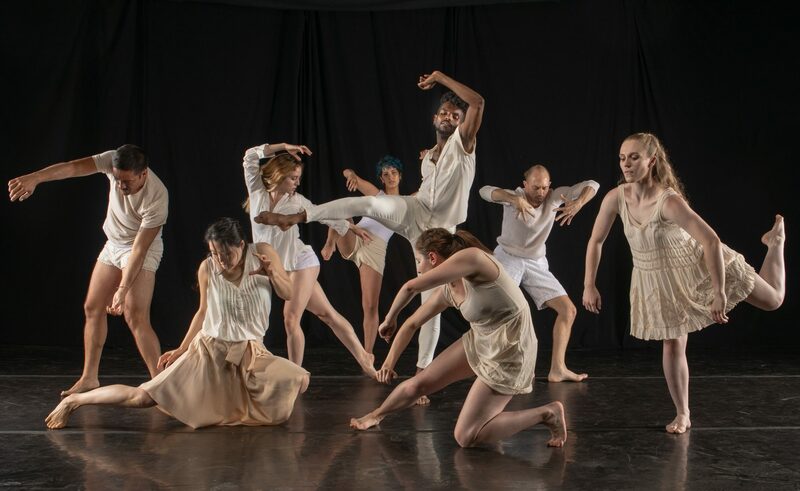 Working collaboratively, the three of us enjoyed challenging the traditional distinction between choreographer, composer and dancer, and using this methodology to question hierarchy, authorship and disciplinary boundaries. We were also honored to be joined by Jessica Hulick of Moms Demand Action and Pastor Cornelius Battle of Ebenezer Missionary Baptist Church who gave a short appeal following the show to continue our efforts from Durham’s March for Our Lives and further the conversation on gun violence prevention. Previous PostPrevious Shaga at Moogfest2018!